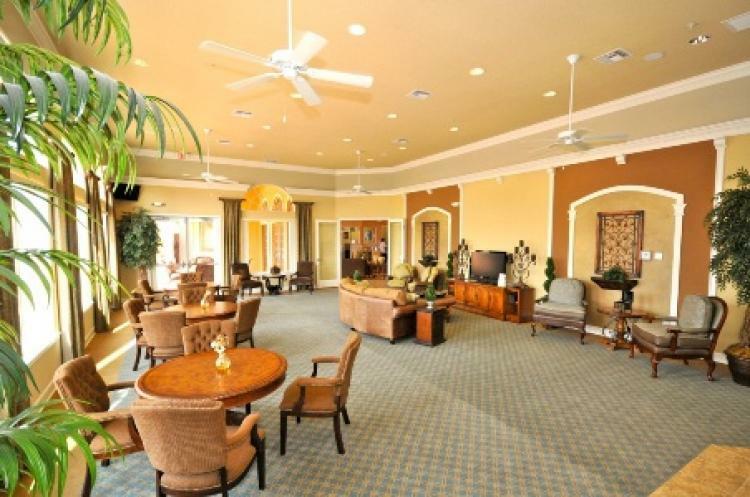 This beautiful 6 bedroom property is located Bellavida Resort Community in Kissimmee. The family home, which is built over two floors, holds 3,500 square feet of living space, with 1,800 square feet on first floor. All bedrooms are spacious, with 3 King Suites, 1 Queen Suite and 2 Twin bedrooms all en-suites. This property has been professionally-decorated and finished to an impeccable standard, and all rooms are air-conditioned. GPS/Sat Nav available for your use. Alongside the house, you will have access to stunning lakeside views, and use of the properties outdoor summer kitchen. There is also a private swimming pool used by the residents of the complex. This perfect location is only seven miles away from Walt Disney Studios, Florida and is close to local bus routes. BellaVida has a 6,700 sqft clubhouse features a heated resort pool and spa, fitness center, cyber café, spacious lounge with televisions, tot lot, plus basketball and volleyball courts. If your looking to connect with nature, a walk through the nature preserve or around the 10 acre lake will surely be in order. Bella Vida, Italian for Beautiful Life, is surrounded by beautiful conservation areas and community lakes. An impressive 25 foot waterfall greets you as you arrive through the gates, and just beyond that is the Italian-inspired Clubhouse. The clubhouse is the largest Park Square Homes have built, having a host of features including an onsite concierge service, a large zero entry pool, cyber cafe, video arcade, exercise room, sand volleyball, basketball, bocce balls, childrens playground, formal Italian style gardens and more, all available for the use of guests staying at a villa or town home on the resort. Lounge With 2 Sofas for you to relax in and watch the 55" TV. Kitchen Is complete with all modern appliances, including dishwasher, waste disposal, microwave, range, refrigerator and washing machine. There is also a breakfast bar for dining, and a pantry. There is also a Tom Tom/Sat Nav System. 1st Master Suite King-sized bed, IPod Docking Station, wall mounted Flat screen TV, carpeted and fully furnished, including blinds & ceiling fan with en-suite. For the little ones a High Chair, Crib & Pushchair. 960 is situated on the Luxurious Resort of Bella Vida. To view more about this resort please Click Here. "Loved everything about this villa,Quality throughout. Pool and Lanai furniture quantity and quality was exceptional All positive and looking forward to future bookings"
"This villa was fabulous and great location. It was a great villa with loads of if space well decorated. There was plenty of dishes and crockery. There was also a BBQ which was spotless but we didnt get the chance to use it. We would recommend this villa and kingdom state villas to friends and family." "Excellent service as usual. Absolutely wonderful thank you." "I would recommend this villa." "Very homely property so did not feel like a rental. Appreciated the external comfy sofas and well stocked kitchen items - eg. cutlery, pans, Nutribullet etc. " "My wife and I can’t thank you enough for ‘pulling the rabbit out of the hat’ when we were faced with the issue of the house that we had booked – in my view customer service really comes when there is a problem to be dealt with – you were dealt a huge problem and my wife, myself and the rest of our party can’t thank you enough for the solution that you came up with Thank you so much for making our recent stay in Kissimmee such an enjoyable one (and for the very professional way that you dealt with the major issue that you were faced with) We will be back in touch soon I’m sure in the very near future with regard to further visits Anne and Lawrence James "
"Beautiful home, fantastic resort, fabulous location. I am sure we will visit this resort again one but if not has definitely been one of the best villas we have stayed in. 2nd visit to this villa. Absolutely love this house and it’s surrounding location. Beautifully decorated and so much space for 6 of us." "The villa was stunning, bedrooms were spacious and very clean. We would definitely use the villa again. We found kingdom state villas a wonderful company to use. We would recommend them to our friends and would definitely use them again. The service was friendly, quick and very informative. Hence we had no reason to contact anyone during our 2 week stay as all information was provided before we arrived. A very happy customer. ðŸ˜�ðŸ˜�"
"Fabulous villa. Everything you could ever want. We all loved it. Such a beautiful high standard villa. Could not fault it. Although there were 9 of us we never felt on top of each other. Will def be using your company again when next back in Florida. Thank you so much. Caroline ðŸ˜Š"
"The house was the best we have ever been to in terms of decor and furnishing inside. " "Fantastic villa. Very clean and beautifully decorated. Everyone had exactly what they wanted." "Fabulous villa in a great location"
"Some directions on how to use the speakers outside would be useful. We will definitely be using it again hopefully next year."